The KRISS Vector Ambidextrous Folding Stock is constructed of steel, aluminum, and advanced polymer composites. The stock can be configured to fold to either the left or the right, it is also telescopic, adjustable to three positions. The KRISS Vector Ambidextrous Folding Stock features two quick detach sling swivel points as well as a sling loop at the rear to accommodate a variety of slings. The stock is available in black and designed specifically for the one piece upper receiver featured on the KRISS Vector GEN II 2017 models. For more information about the new KRISS Vector Ambidextrous Stock visit the KRISS USA Web Store: www.kriss-usa.com/store. The announcement is a bit dated, but KRYTAC (KRISS’ training and simulation arm) has started producing their own line of Vector AEGs. June 30, 2017 – Brea, California, USA – Today KRYTAC®, KRISS USA’s brand of premium performance airsoft and training products, launches the first and only officially licensed KRISS® Vector AEG. The all-new AEG is the first of its kind, and an exact replica of the KRISS® Vector SMG Submachine Gun. The KRYTAC® KRISS® Vector AEG is shipping now to KRYTAC® distribution partners. The dimensions of the all-new KRYTAC® KRISS® Vector AEG are a 1:1 scale to its firearms counterpart. 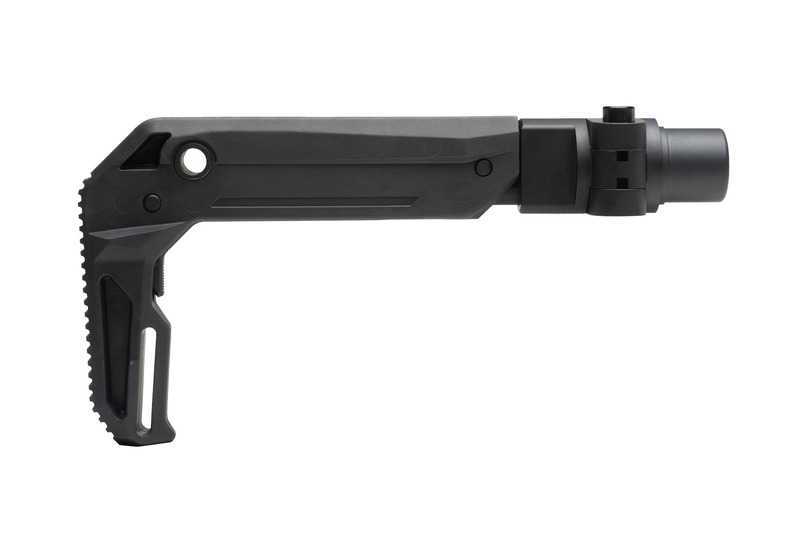 Additional external features include the side folding stock, ambidextrous safety and selector switch, MIL-STD 1913 picatinny top rail, MIL-STD 1913 picatinny bottom accessory rail, and a Trident flash hider mounted to the 14mm counter clock wise threaded barrel. Internally, the AEG is powered by a vertically oriented mechbox, with V2 compatible gears, piston, piston head, and cylinder. A short type motor pulls the AEG main spring, which is guided by a quick detach metal ball bearing spring guide. Semi, two round burst, and fully automatic fire modes are controlled by a micro-switch trigger and electronic control board with integrated 3034 MOSFET. Additional internal features include the famous KRYTAC® rotary hop up, bucking, and a 155mm inner barrel. 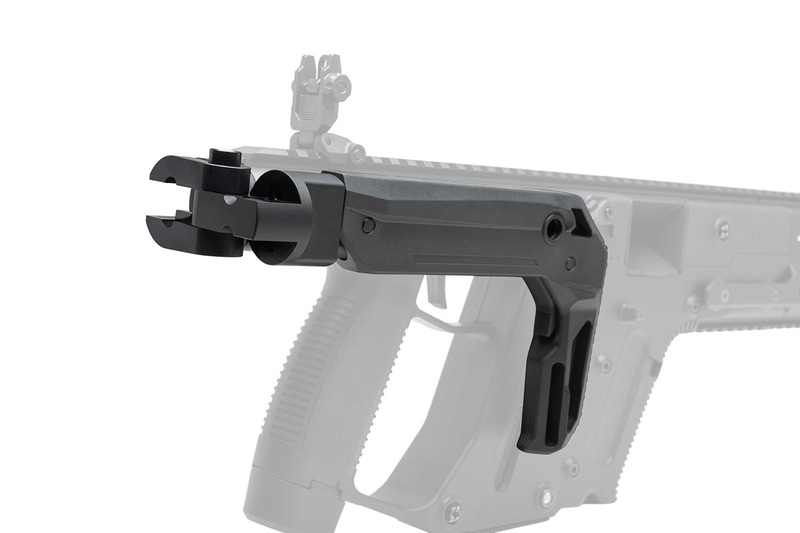 Feeding the KRISS® Vector AEG is a 95 rounds mid capacity magazine. Factory standard accessories include the DEFIANCE® front and rear folding polymer sights, a 7-slot MIL-STD 1913 picatinny side rail section, and one magazine. Initial deliveries of the KRYTAC® KRISS® Vector AEG will ship with one (1) additional free mid capacity magazine. The KRYTAC® KRISS® Vector AEG is shipping now to the United States and is available for a suggested retail price of $449.00 (US). Other international markets including Asia, Europe, and South America will receive initial shipments by the end of July. First deliveries to Canada will be made by the end of August. Additional magazines are available individually for $24.95 (US), or as a three-piece value package for $69.95(US). International pricing varies by region. KRISS USA will use all available means to protect worldwide patents and trademarks. August 31, 2016 – Chesapeake, Virginia, USA – KRISS USA, developer and manufacturer of the KRISS Vector family of firearms, has been made aware of an unauthorized and unlicensed reproduction of its KRISS Vector SMG in the form of an AEG replica by A&K Airsoft. Despite several official notifications, A&K Airsoft has pursued into the continuation of this project, and is planning release of this unlicensed product. KRISS USA is an innovation leader in firearms technology, revolutionizing firearms operating systems and designs with the KRISS Vector Submachine Gun. KRISS USA is heavily invested in the technology and design of the KRISS Vector, including non-lethal, training and recreational shooting models through its brand KRYTAC, in order to deliver to its customers an uncompromised level of quality and performance to reflect its brand values. KRISS USA is prepared to take all necessary actions to aggressively protect those investments and commitments. KRISS USA will be actively pursuing manufacturers, importers, distributors and retailers, to the fullest extent of the applicable laws, for any infringements on its patents, designs, trademarks and rights in the United States, Europe, and Asia for the unauthorized manufacturing and distribution of KRISS product replicas. Furthermore, KRISS USA is actively preparing its actions in the countries of Poland, Russia, UK, Italy, Taiwan and Japan. KRISS Group SA officially entered into a trademark licensing agreement with War Sport Industries, LLC to produce the LVOA rifles, in .22 LR and 6mm, through its training and recreational shooting products brand, KRYTAC. October 7, 2014 – Nyon, Switzerland – KRISS Group has entered into a worldwide license agreement with War Sport Industries, LLC to manufacture and distribute .22 LR and electric airsoft LVOA rifles under KRISS Group’s KRYTAC brand. The agreement between KRISS Group and War Sport Industries represents an important step forward for KRYTAC to produce affordable training solutions based on innovative firearm products. The LVOA’s advanced design compliments the KRYTAC rifle product line with its unique silhouette and reputation for excellence. “War Sport Industries is very excited to be partnering with KRISS Group SA in the LVOAtm trademark licensing agreement for the KRYTACtm and .22 LR product lines. The partnership brings two very innovative and “out of the box” manufacturers together to offer both training and recreational shooting products known as KRYTAC,” said Joey Boswell, CEO of War Sport Industries, LLC. The KRYTAC LVOA .22 LR is intended to become the affordable shooting alternative for the range day enthusiast and tactical trainer by replicating the form and function of the 5.56mm LVOA rifles. The KRYTAC LVOA AEG (Airsoft Electric Gun) will provide shooters with a low impact, non-lethal training solution and replicate many of the same features of the War Sport LVOA rifles. It will be powered by the KRYTAC Nautilus 8mm Reinforced Gearbox. The KRYTAC LVOA .22 LR and AEG are targeted for 2015. Release dates and pricing will be announced at the 2015 Shot Show Exhibition in Las Vegas, USA. KRISS launches the Vector “Enhanced” Series for its line of .45ACP firearms featuring new customization options and Magpul Accessories. January 14, 2014 – Las Vegas, Nevada, United States – The KRISS Vector Enhanced Series is comprised of the Vector CRB and SBR models equipped with an M4 stock adaptor, Magpul UBR stock and MBUS flip sights. The scheduled release date for the Enhanced Series is set for Q2 with an MSRP targeted at $1,995.00. The Magpul stock and MBUS sights give the Vector a similar feel to the ubiquitous AR-15. The stock adaptor, which makes the attachment of the UBR stock possible, will be available for sale separately and allows for a new avenue of customization for the Vector. Magpul MBUS Sights equipped on the Enhanced Series were designed specifically to match the Vector’s unique shape. According to KRISS USA Marketing Manager Tim Seargeant, the Enhanced Series will feel familiar to more shooters, making it easier to adapt to the Vector’s futuristic design, and is now more customizable. “The KRISS Super V technology inside the Vector is designed to enhance shooting performance by mitigating recoil forces. Magpul products aim to enhance shooting performance through external upgrades. The Vector with Magpul accessories is a great pairing.” Seargeant adds. For more information regarding the Vector Enhanced Series, visit KRISS at SHOT Show Booth #432 or go online at www.kriss-usa.com . Airsoft GI is less than four thousand Facebook Likes away from giving away a KWA KRISS Vector GBB SMG. You could be one of the first people in the world to own one, and you won’t even have to pay for it. Just gotta go out, spread the word and make sure all of your FB friends like their page.